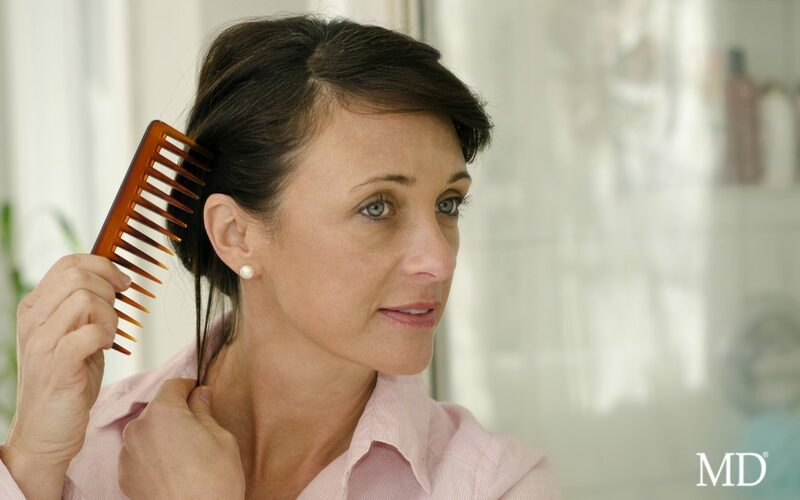 The onset of menopause is when many women face hair loss and thinning hair. In fact, approximately 40% of women will experience thinning hair after menopause, which – surprisingly – is about the same percentage as men. Why then, you ask, don’t we see more bald women? The simple answer: because women have different balding patterns than men. They lose hair from all over the scalp. The subtle change in hair volume happens over a period of time; which explains why many women don’t even realize how much hair they are losing, until a significant amount is already gone. So why does menopause cause hair loss in women – and what can be done about it? As in childbirth, there are significant hormonal changes for women during menopause. During pregnancy, many women may experience an increase in female hormones, which causes their hair to be fuller. Yet during menopause, the opposite happens: increasing levels of male hormones (androgens) can negatively affect hair follicles. The androgens weaken the hair follicles to the point where they may even become completely inactive. Does hormone replacement correct the problem? Unfortunately not. Although hormone replacement is effective at treating other symptoms of menopause, it does not solve the problem of thinning hair and/or hair loss. There are other factors that may also contribute to hair loss during the time of “the change”. These factors include: heredity, stress, diet, illness, thyroid conditions and certain medications. The most important thing to do is to recognize the early signs of hair loss… and to take action! If you’re losing hair (as evidenced by a great deal of hair in the shower drain and in your brush) don’t deny it. Realize this is a treatable condition with products that have been specifically developed to help. MD offers a well-rounded approach—a complete program per se—of products developed by Dr. Susan Lin. Start with MD Nutri Hair. This physician-formulated, drug and hormone free daily supplement fights hair loss because it targets DHT (the hormone that causes hair loss). MD Nutri Hair addresses oil build-up on the scalp while restoring damaged hair and excess shedding. The powerful formulation features lilac extract for maximum potency in protecting the hair bulb. Follow this with a daily application of the MD Scalp Essentials serum and the MD Follicle Energizer. These products work in tandem to decongest and condition the scalp, creating an optimal environment for hair growth. If you’ve been worrying about hair loss, then put your mind at ease today. Commit to a program of products that are working for thousands, developed by a world-renowned expert in hair restoration—Dr. Susan Lin. Money-saving Tip: By purchasing all of the above items in the MD Restoration Starter Kit, you’ll save $40 over purchasing them separately. When used together, these products provide quick, easy, optimum results. Formulated using innovative plant stem cell technology, MD Nutri Hair nourishes the hair from the inside. The Scalp Essentials serum provides optimal support to the scalp so hair can reach its full potential. The MD Follicle Energizer was designed to combat hair shedding from stress and overworked hair.